It’s easy to think working less and making more is something available only to a blessed few. James has proven over and over again this is not the case. 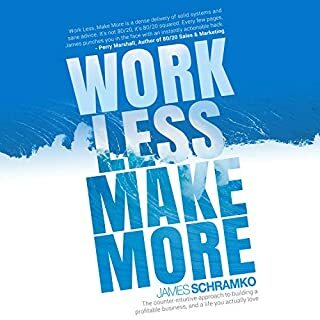 If you want to build a business that gives you financial peace of mind while allowing you to enjoy life now, not later...Work Less, Make More will get you on your way. It will help ensure the business you're building will work for you, not the other way around. loved this book very easy to understand the in-depth methods and formulas the author uses to create a successful on-line re-occurring business. the narrator speaks clear and slow so listening to this book at times 1.5 or more gets you through the book very fast.